It’s a very common problem not only in women but in men as well. Cellulite doesn’t discriminate either. It affects the young and the old, the skinny and the non-skinny, and the fun and boring. The important thing to keep in mind about cellulite is that it’s just fat and therefore it is fixable. It just seems different than other fat because it pushes against the connective tissue causing the skin above it to pucker. You also don’t have to worry about it being harmful. To some people the worst thing it is, is unsightly. It’s important to keep in mind that having cellulite doesn’t necessarily mean you are overweight because thin people get it as well. However, if you are overweight then losing weight can reduce cellulite. If you want to get scientific about it, then the main cause of cellulite is believed to be a lack of blood flow to the affected region. This means that when circulation decreases, collagen levels decrease as well allowing the fat cells to enlarge. So when we say that cellulite is fat that pushes against the connective tissue another way to think about it is when the fat cells grow they push their way to the top of the skin as it becomes less elastic. Weak skin combined with large fat cells is a recipe for cellulite. If you are looking for a super quick “fix” to cellulite are light-skinned then you can apply self-tanner because cellulite tends to be less noticeable on darker skin. First, it’s important to understand that getting rid of cellulite, like any other fat, is a process. You aren’t going to find a miracle pill that makes it disappear overnight. Some people tend to think that losing weight and burning fat requires a ton of working out, but it’s possible to lose weight without exercising. It really becomes dependent on the things that you put into your body combined with some form of physical activity. 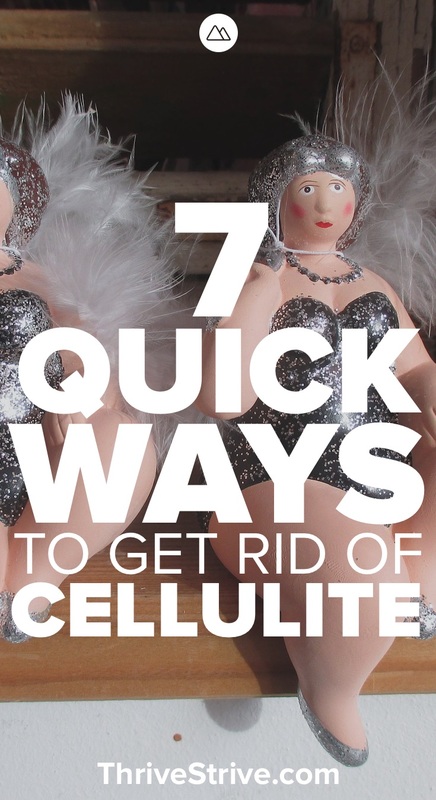 With that being said, here are 7 ways to help you get rid of cellulite effectively. Bad carbs are really where fat gets its life. One of the best ways to kill fat is by destroying its main life source: sugar. I’m a sweet tooth so this method is always difficult for me. By no means do you need to cut out sugar completely, but you can probably pull back on the consumption of it a bit. If you know someone that has been eating candy bars for 70 years and they seem to be fine it’s important to realize that each body is unique. Just because someone lives to be 120 smoking cigars and drinking whiskey it doesn’t mean that is the wisest life choice. For those with sweet tooths as big as mine you can replace sugar cravings with gum, lemon water, or fruit. Careful with the fruit, though. I tried to replace my sugar cravings with fruit and ended up consuming so much fruit that I was actually adding more sugar to my diet than before! Everyone should love this method. Getting a massage helps blood circulation throughout the body and because cellulite is a result of a lack of blood circulation getting that blood moving will help to get rid of it. If you want to kill two birds with one stone then you can get your partner to give you a message with coconut oil. Coconut oil seems to benefit everything in the world and in the case of massages, it will help to moisturize your skin while making you taste like a Piña Colada. If you’ve never gotten a massage before there might be some slight discomfort. Massages are supposed to be a little rough. Your tense and tired muscles are being worked so it’s not always going to feel like unicorns and rainbows. Just as long as the aftermath feels good that is all that should matter to you. Since I work from home it’s hard to consume enough water. I get too caught up in other things and then when it’s time to go to bed I realize that I completely forgot to drink any water at all. Funny enough, when I worked in an office I drank more water than was needed because I was always getting up and walking around. I was bored. Sue me. If you are looking for more ways to drink more water check out Leila’s 10 Ways to Drink More Water. This one seems kind of obvious. You know when cellulite became a thing in our culture? When more people started working at desks instead of jobs where they moved around a lot. The more you move, the better blood will flow throughout your body. If you aren’t moving then your blood isn’t flowing as well. If you want to try working out a bit more to help with your blood flow situation and don’t want to leave the house then check out our Burn 1,000 At-Home Workout. If you want to increase circulation of blood in your body then there is no better nutrient than Omega-3 fatty acids. Blood seems to use these nutrients like a surfboard riding a wave. How do you add more Omega-3 fatty acids to your diet? You can start with consuming more fish like salmon or halibut. If you quickly tire of fish or they just aren’t your thing then you can look into adding flax seed oil and walnuts to the mix. If figuring out what you need to eat and how much is too much of a hassle you can always go the supplements route and take Omega 3 Fish Oil. Even if you aren’t trying to get rid of cellulite you should be trying to find ways to incorporate more Omega-3 into your life. Enjoyed 7 Realistic Ways to Get Rid of Cellulite? Share it with your friends so they to can follow the Thrive/Strive journey.